SAFE Alert! 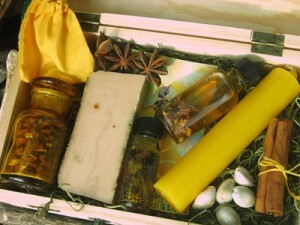 Fraudulent Orishas Sold Online! It was recently brought to our attention that there is an Ifá foundation claiming to sell orishas online, and what is being sold is little more than concrete sculptures. This organization offers an entire line of Eshus, each of which is attributed different magical properties, or Eshus said to be aligned with different orishas‘ energies. 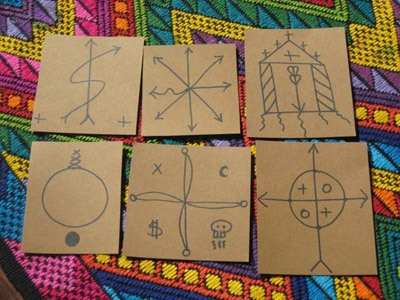 This is not only incredibly outside the tradition of Santeria Lukumí or even traditional Yoruba Ifá practice, but is entirely unethical and fraudulent. This organization claims to be Ifa-centered and descended from Lukumí origins, although they are well-known for their reinvention of religious practice to the point that their current practice is no longer Lukumí nor traditional Yoruban Ifá. The baffling Eshu Sigidi sold by this foundation is nothing more than an Nkisi statue from the Congo – not Ifá. This organization’s online store claims to sell spiritual tools that “ignite your power within”. 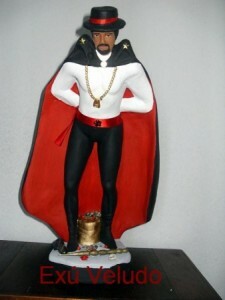 The area that drew the attention of SAFE (Santeros Against Fraud and Exploitation) is a section claiming to sell Eshus or Elegguas. The site offers Eshus like: “Eshu Obatala“, “Eshu Ogun“, “Eshu Yemonja/Olokun”, “Eshu Oke”, “Eshu Chango“, “Eshu in a Locket”, and even “Eleggua–Eshu Ogun Keychain”! 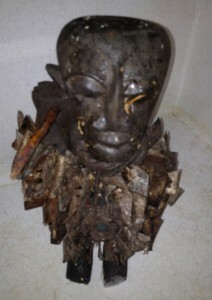 They also offer the baffling “Eshu Sigidi” that appears to be a hybrid between a Congolese Nkisi statue and an Eshu. You will notice in all these instances, they are blending together the names and apparently the attributes of two, sometimes three, orishas‘ energies. 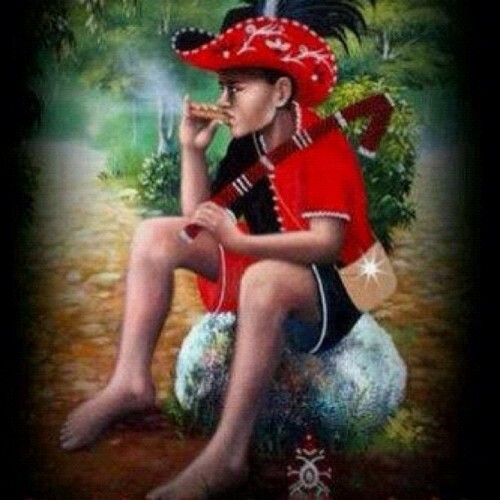 Eshu is Eshu, Eleggua is Eleggua. 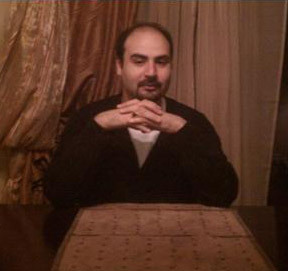 Eshus are constructed by Babalawos. Elegguas are birthed by Olorishas. They are made in different ways and with different items. While they may be related orishas, it is important to understand that one is not the other. Calling something an Eshu-Eleggua is a red flag that this foundation is operating in the waters of Joseph Campbell’s “similar gods are the same god” philosophy which is not traditional Yoruba nor Lukumí. Eshu has roads (caminos) with specific names: Eshu Bi, Eshu Laroye, Eshu Barakikeño, Eshu Alawana, etc. not names like “Eshu Ogun” nor “Eshu Obatala“. 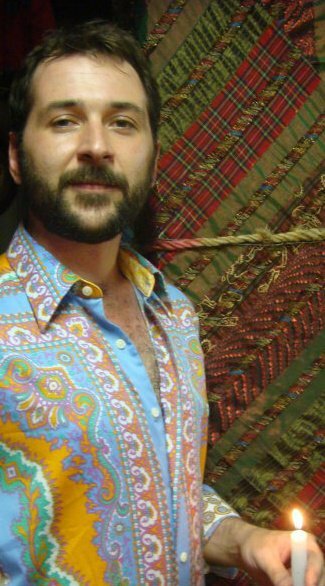 That is a whole-cloth invention that is outside the scope of traditional Ifá practice. Eshu Oshún Ayé – a mish-mash of three different orishas sold by this fraudulent foundation. Notice it hasn’t been fed any animal sacrifice and it is painted green. Additionally, this foundation of Ifá sends these Eshus through the mail, and never presents them to the intiate on the holy mat “até”. Every orisha or initiation is received by that person while kneeling on a mat (with the exception of the kariocha where the initiate is seated on the Odó which is on top of the mat). The godparent is supposed to pray over the newly consecrated item (be it an Eshu, elekes, idé of Orunmila, Orisha Addimú, etc. ), place it in the godchild’s hands and explain what the item is, how to use it, and then bless that initiate that the orisha may serve them to bring iré into their life and keep away osogbo. Babalawos also often chant the songs and prayers for the various odu associated with that initiation. The grass mat “até” is a holy place for us in the Lukumí and Yoruba faiths. This is where the orishas come down to earth and are present in the world. 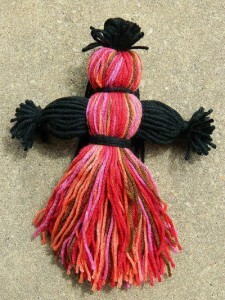 You must receive an orisha or item on the grass mat for that is the meeting place between humankind and the orishas. Receiving something through the mail does not qualify as a legitimate reception of any orisha. That person hasn’t received a thing. The Orishas given by this foundation of Ifá were also found to have the wrong items or improper items inside of them. For example, all of the orisha shrines use naturally rounded stones found at the river or ocean (or occasionally pieces of coral – like Eshu Afrá or Babalú Ayé). These are typically metamorphic rocks, not crystals. The Oshun this individual received from this foundation contained 5 multicolor tumbled quartzite stones, 18 cowries and no tools. Oshun’s otá (stones) must be yellowish or orangish in color and are river rocks, not tumbled quartzite stones. When the foundation of the orisha – the otá (stones) – is incorrect, the very body of the orisha is not properly prepared to receive and seat the spirit of that orisha in the physical form. 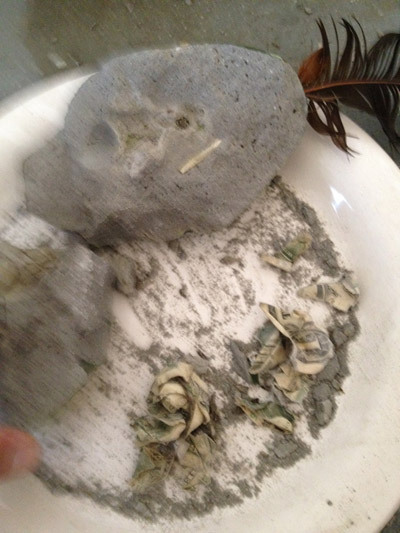 The above pictured “Eshu Oshún Ayé” contained nothing more than shredded dollar bills. The Ogun that this individual had been given contained nine multicolored quartzite rocks, and two out of seven of the proper tools along with a handful of nails. Ogun’s shrine received in the Warriors has one rock (some lineage give two rocks – one for Ogun and one for Ochosi), but certainly not 9. Nine isn’t even Ogun’s ritual numbers. His rocks should be black smooth stones, not multicolored rocks. 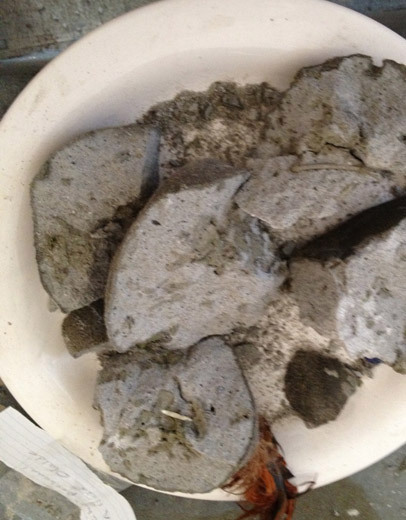 Additionally, this foundation instructs people to grease Ogun’s shrine with olive oil on a regular basis. There are no olives in Africa. This is an outright invention and is totally illegitimate practice. Ogun’s shrine should be greased with red palm oil (epó) which is easily obtained at any African store or online. We’ve even purchased it on Amazon.com! There is no excuse for using olive oil on our orishas. The Eshus distributed by their online store had lots of problems too. They had no aches inside, no herbs and none of the expected items required in an Eshu. First, a stone must be present as the resting place for that orisha’s spirit in every orisha shrine. 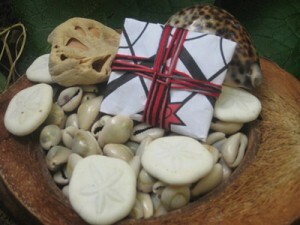 The odu Oshé Meji requires that “The orishas are stone, shells, water and herbs”. No stone, no orisha. 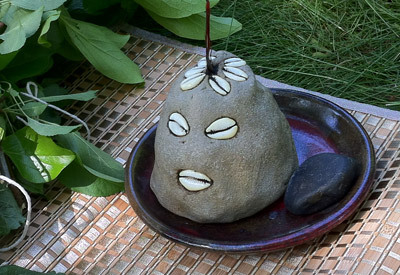 Even if the Eshu is constructed of cement, there must be a stone within it or beside it. 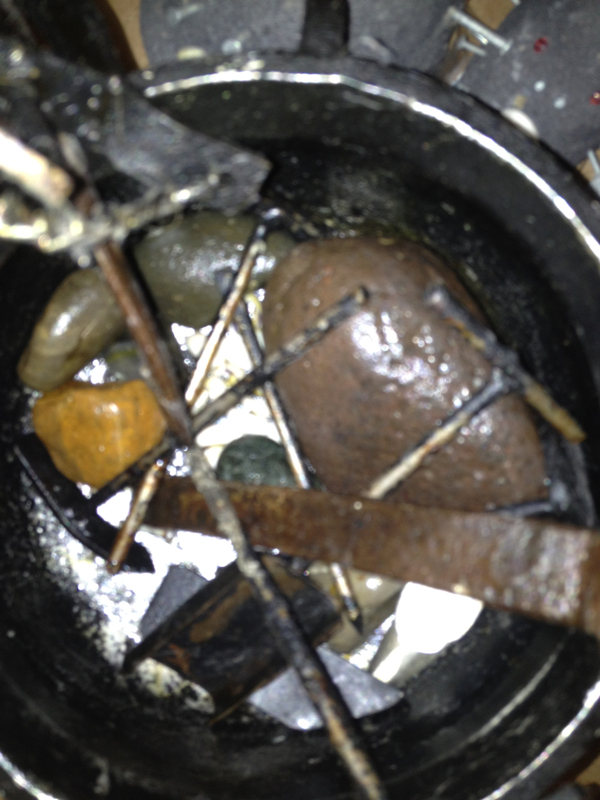 This person’s “personal Eshu” did not have a stone in it… in fact it had NOTHING inside of it. 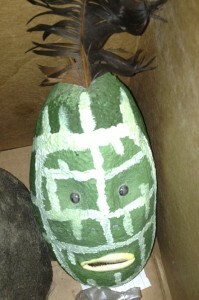 It was little more than a cement sculpted head. Personal Eshus are supposed to be the most custom of all Eshus. They are tailored for a person’s specific spiritual energy and needs. 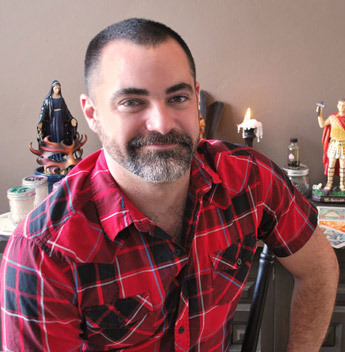 Sending someone a personal Eshu that is completely empty is not only a fraudulent and unforgivable practice, but can seriously harm someone spiritually. This victim was sold a “Personal Eshu” that was completely empty and devoid of any required items for empowerment. The “Eshu Oshun Ayé” this individual bought had shredded dollar bills inside of it, and nothing more. 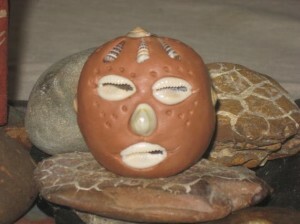 First, Eshu Ayé is made in a conch shell, not as a sculpted cement head. Next, there is no such thing as “Eshu Oshun” – that is an invented name. Eshu is certainly not painted green. Additionally, if any money is to be put inside of an Eshu it would be coinage as the metal of the coins has a real value. Paper does not have a real value for this use. This Eshu had no ashé inside, no herbs, no items of value or spiritual significance. It was a blatant fraud. 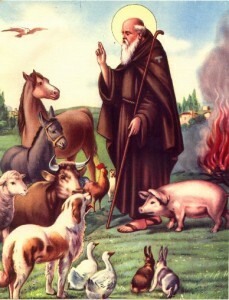 Animal sacrifice seems to be the greatest point of contention with the Santeria and Ifá religions. This foundation which claims to follow an Ifá practice in the more traditional African way, sends out these orishas without having given them any blood sacrifice. You’ll notice the items are sparkling clean. No matter how hard to try to clean an orisha‘s shrine that has been fed, you will always see evidence of some blood left. These never received blood sacrifice. Animal sacrifice is a necessary and defining part of traditional Ifá and Santeria practice. The blood of animals is sacrificed to the orishas‘ shrines so that they become a concrete and physically rooted incarnation of a spiritual being. The orishas are transcendently spiritual. Creating their shrines makes them physical and gives them manifestation in the physical world so that we can interact with them. Without the act of feeding these items the blood of sacrificed animals they are still ephemeral and not anchored in the physical location of those consecrated items. 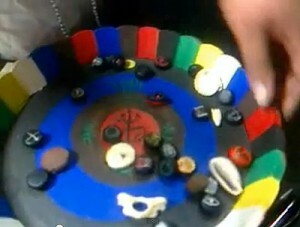 Improperly prepared Ogun with nine stones and incomplete tools. The practice of animal sacrifice was first prescribed by Eshu in the diloggún odu of Ofun Meji. The 16 odus were tasked by Olofi to descend to earth and make it a suitable place for humanity, but Oragun (Ofún) said to Olofi that it was an impossible task for there were too many obstacles to overcome. Eshu stepped forward and prescribed ebó: sacrifice 101 white pigeons to the earth. He explained that the earth was like a leopard that would eat anything on its surface, so to tame it the blood of these sacrificed animals had to touch the earth, cooling it so that humanity could live in peace. Thus was born the act of animal sacrifice as part of our religious practice. Additionally in the diloggún odu Edigbere we are reminded that animal sacrifice not only benefits the person doing the ebó but also helps all of humanity – even those uninvolved in our practices, for it keeps osogbo at bay and helps better our lives. There are those who would try to modify our religions to remove the act of animal sacrifice. This is a grave mistake. We have ritual requirements both in odu and through the spiritual technology we use, to implement blood sacrifice. No blood sacrifice = no orisha. The blood feeds them and fixes their ephemeral energies into the physical items of their shrines. Additionally, animal sacrifice is a normal part of Yoruban culture which naturally is found in the religions that originate with their culture, namely Lukumí, Ifá and even Brazilian Candomblé. To remove the animal sacrifice is a disrespect to the countless African ancestors who risked their lives to hold to their culture and religion in the face of adversity and persecution from slavery. They felt it was a critical part of our religion to the point that it was worth dying for, should they be discovered. For us to deviate from that practice is a disrespect to their sacrifice and doesn’t hold with the Yoruban cultural value of honoring your ancestors and their efforts; it removes the social component of a religion that is strictly social in nature. Beware of anyone who claims Santeria Lucumi or Ifá orisha worship without animal sacrifice. Shrines and Eshus given without any animal sacrifice are definitely not orishas and certainly not part of the traditions of Ifá nor Santería Lukumí.